Clips are trimmed at random into smaller segments that are woven together into a shortened final movie that you save as a separate movie file. Clips longer than 1 minute are separated into 1-minute mini-segments, from which random segments are extracted and combined to create a trimmed segment representing the original minute-long clip. Clips shorter than 4 seconds are left as-is and are not trimmed. Click a video clip or photo in the Workspace — one that you want to use to create your movie — to select and highlight that clip. 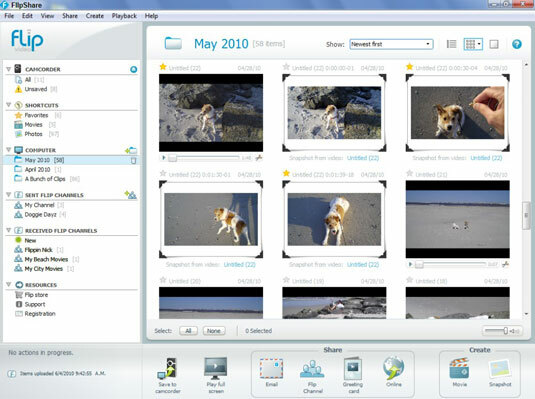 Hold down the Ctrl key to select more than one video clip or photo. Click the Movie button in the Create section of the Action bar beneath the Workspace to open the Create Movie window. If you selected only one clip for your movie, proceed to the next step. Otherwise, feel free to drag and drop your clips to rearrange the order in which they appear. You can also drag more clips or pictures from the Workspace into the Create Movie window, or remove ones you don’t want by clicking the X button to the upper left of the clip. 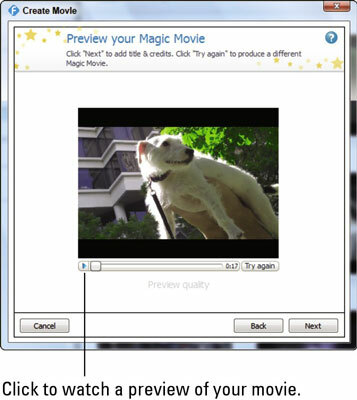 Click the Magic Movie button in the bottom-right corner. FlipShare processes your selection and then displays a preview of your movie in the Create Movie window. Click the Play button to watch a preview of your movie if you want, or just click Next to display the next Create Movie window step, which involves adding titles and credits to your Magic Movie. The Back button takes you back to the Create Movie screen, where you can rearrange your clips, delete ones you don’t want, or add new ones. Select the check boxes next to any of the title and credit options to add those options to your movie; if you choose the first or second options, click in the text field of the preview thumbnail for those options and type in the text you want to appear. Note: Any text you type in the title or credits sections is limited to only what fits in the box; you can type more text if you want, but no one will see it because it doesn’t appear when you play your movie. Click Next to display the next Create Movie window, which lets you choose an audio file and options for how your chosen audio file plays in the background as your movie plays. Select one of the Music File choices. Play your selected music track softer or louder than any ambient sound that was captured with your video when you recorded your video (such as people singing “Happy Birthday,” or crashing ocean waves and cawing seagulls). Play only your background music track but none of the ambient sound you might have recorded when you captured your video. Click Next to display the next Create Movie step. In the Name field (shown below), either stick with the default name provided or type a name for your movie file. (Optional) If you want to save your file to a different location than the one displayed under “To Folder,” click the “Change Folder” button, choose your desired location, and then click Save. You’re taken back to the “Create Movie” window. Click the “Create Movie” button. The Progress box displays the “FlipShare is Working” message and a progress bar as FlipShare creates your Magic Movie, followed by a “Movie Created” message when your Magic Movie is complete. Your new movie appears in the Workspace ready for you to share with others.